"Yo, Ho, Yo Ho!" 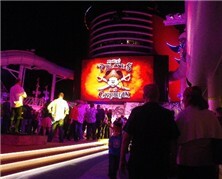 Join Captain Jack Sparrow's pirate crew onboard Disney Cruise Line's new 130,000-ton Disney Dream. If you enjoy the "Pirates of the Caribbean" motion pictures, this new largest-ever Disney ship is the perfect floating spot for an evening of bucanneer-style fun -- from the kid-centric "Mickey's Pirates in the Caribbean" to fireworks choreographed to movie music. A Buccaneer Bash features Captain Jack rappelling down the funnel and ghoulish creatures from Davy Jones' locker. Disney Dream, Disney's largest ship, features a unique "District," a dining and entertainment enclave designed for adults. Couples might enjoy pre-dinner drinks, listen to music or meet friends for late-night conversation and dancing. 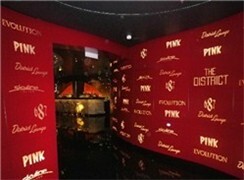 The District proves that Disney isn't just for kids! Come along for a PHOTOLOGUE that shows some of the facilities in this enclave of fun. When booking a Port Canaveral cruise on Disney Cruise Line or another line, many consumers opt to also enjoy a pre- or post-cruise tour in the theme parks of central Florida. Walt Disney World remains a magical highlight. Freelance travel writer Georgina Cruz outlines the pixie-dust sprinkled new attractions, high-tech experiences and dining options that should entice visitors to Disney's FL theme parks this year. So bring on the magic! It's official! 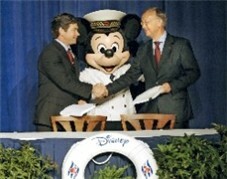 Disney Cruise Line is expanding -- in fact, doubling -- its fleet size from two to four ships. 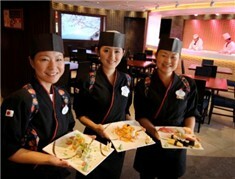 The cruise line announced plans for Meyer Werft to build two 124,000 ships for the family-focused line in early 2007. Photo of that deal signing is at right. 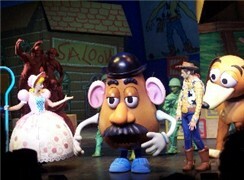 DCL Launches"Toy Story: The Musical"